It really makes a difference when you’ve got something to compare with and I’d have to say, having eaten cupcakes from different businesses really gave me perspective as to what a truly great cupcake really is, so here, I’m going to compare a few cupcakes I’ve had recently — essentially, the same thing when you look at it, but a world of difference when it comes to taste. I’m not listing the addresses and phone numbers seeing some businesses have more than one location, but I’ve provided the link to their website. Sprinkles Cupcakes has got to be one of the most popular cupcake stores around OC right now but ya know, I’ve never been highly impressed. The cupcakes are hit and miss — sometimes they’re pretty good, other times they’re really dry. Red velvet, chocolate, vanilla, I’ve tried them all. Frosting is out of control in terms of quantity and very very sweet, great for those with a severe sweet-tooth, but I like my desserts a little more well-balanced. Oh For Sweets Sake Mobile Cupcakery and Bakeryis an Orange County food truck featuring a range of cupcakes which comes to you although in reality, they are parked at various locations daily and you go to them. The cupcakes definitely look better than they taste…. both the cake and frosting portion were average, there is no wow-factor when you bite into one. In fact, I stopped at one bite. I tried the chocolate peanut butter and the red velvet, both were underwhelming. The cake wasn’t moist and the frosting VERY sweet, gooey, sticky and paste-y in texture. Nothing about these cupcakes shouted uniqueness. I’ve got friends who bake better cupcakes than these. Sorry! Concept is good, but definitely fell short in flavor and texture. Frosted Cupcakery is a little out of the way for me but I’ve tried them on many occasions when friends have brought them to a party and I quite like their selection. The red velvet, lemon, chocolate offerings are all good, the cake part moist and the frosting not sickly sweet. This is a really good cupcake and I have no trouble buying these to bring to a party or when I throw a party myself — but again, they are out in Long Beach so a little out of the way for me. Meringue Bake Shop unfortunately doesn’t have a shop, they are strictly a catering business and it is such a shame because they have some of THE BEST cupcakes I’ve ever tasted! The cake is soooooooooooo moist and the frosting so delicate and flavorful without the nauseating sweetness — hands down my favorite cupcakes to date! 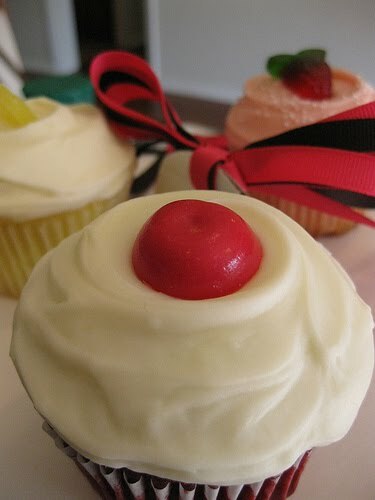 They also have innovative toppings such as the Sweet & Salty — a vanilla cupcake with a salted caramel buttercream frosting. 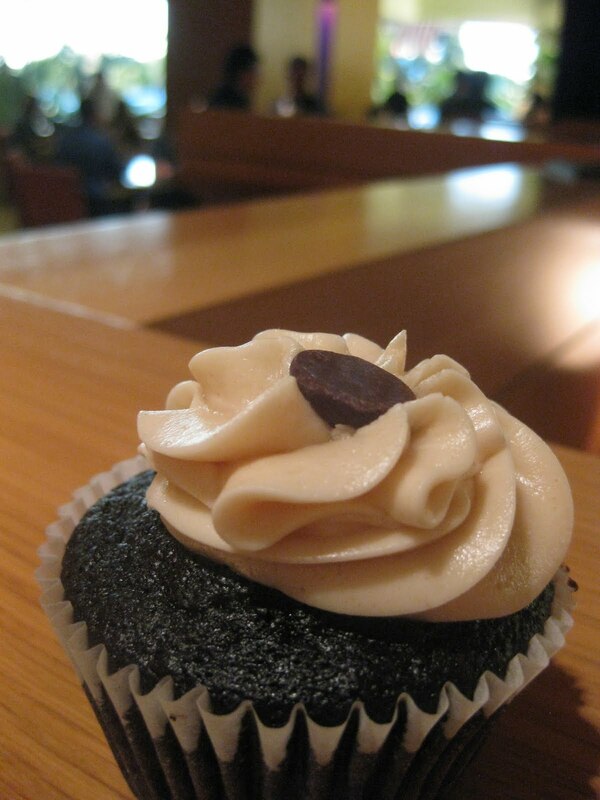 The MFEO was a chocolate cupcake with a peanut butter buttercream frosting — absolutely divine and I don’t often pay high compliments to sweet things. Itty Bitty Sweets is another cupcake caterer who specializes in both standard and mini cupcakes as well as pretzels. I found these at OC Wine Mart & Tasting Bar‘s grand opening and snagged one each of the Lemon Drop and the Southern Belle (red velvet). I was a bit skeptical with these mini cupcakes seeing I had just come from a lunch where the mini cupcake was dry as dust! However, I was so pleasantly surprised by how good both the flavors tasted — I’m partial to the lemon drop though — with the cake portion moist and the frosting, though a tad too sweet for my palate, was not bad at all! Was very impressed by how the cupcakes were on the disply for quite a while and still remained moist! Cupcake Blake is one of those places you probably would never get the chance to try because they don’t have a shop and I was lucky enough to try their cupcakes off Short Stop BBQ food truck. The truck wasn’t even selling their cupcakes because they were parked next to Oh For Sweet’s Sake (mentioned above) and felt bad about selling them with the other truck parked next to them, but offered it to us for being customers. I was really impressed by these cupcakes. The cake portion was very moist ad the frosting was nice and light and the sweetness highly palatable. In fact, my three friends who were there all raved about how good the cupcakes were and one of them even managed to convince them to sell some to her to take home even though they weren’t displayed for sale. We told the owner of the truck that his cupcakes were seriously good and were told that they were made by Cupcake Blake. I’m definitely glad to have tried these! At $2.50 a pop off the truck these are well worth it because every bite was absolutely delicious!! I hope I see more of these cupcakes around! >Wow look at you Anita reviewing cupcakes, never thought I'd see you reviewing sweets. Sounds good though. Too bad the ones you like the most are catering places only. >So glad you did a cupcake review! >I've been fortunate to eat many cupcakes from Meringue Bake Shop because as you said, they are divine but better than that is sharing them with friends. I love the look on their faces when they bit into one and look back at me with tears in their eyes and almost crying because they are so good. Then stating "These are the best cupcakes I've EVER eaten". This has happened several times. Meringue Bake Shop is easy to order from. They have a menu on their website at http://meringuebakeshop.com and only need a 3 day notice. Plus, delivery is free! So yes, they are not immediate gratification, but one well worth waiting for! >i still want you to try frostings… but i'm afraid. come on a thursday, friday, or saturday and get the pumpkin! i can guarantee that one being good. >heyyy…nice rundown! i have tried Meringue bake shop as well, and yeah, they are really really good! >Shari: that's sort of how I felt when I first tried one. I've never been a fan of sweets but lately there have been a few surprises which came my way, one of them being Meringue Bake Shop! It was positively THE best cupcake I've ever tried to date! >Anita..I am very glad you were able to taste 'Cupcake Blakes' cupcakes. Her icing alone is fabulous! I think It has a lot to do with the fact she loves serving others and baking cupcakes and scones is one of the Fabulous ways and yummy ways to serve. 🙂 You can almost taste the love. (if that is possible..to taste love). If you wonder what love taste like…well it's sweet, rich in flavor,warm and melts in your mouth. :-)Enjoy! >Kristi: yep and I got 4 more flavors today — will be sampling them later! I'm excited! I got to meet Sarah today — she's definitely very passionate about her baking! >I'm curious to know if you've had susiecakes? i always go to the one in the south bay but i believe there is one in the OC. they are my favorite cupcakes by far and i hate cupcakes with too sweet frosting like you. >Nope never tried Susiecakes — I'll give them a whirl! I'll be posting another Battle of Cupcakes soon — let me try a few more 🙂 thanks for that tip!! Great review. I agree with all of the ones I’ve tried. Meringue is definitely a hidden OC gem.